Web.com—How Do I Access My Facebook Business Page? Don't Have a Personal Facebook Profile? Do You Already Have a Personal Facebook Profile? Are You Already a Page Admin? 3. Visit your Facebook Business Page. 4. On the left side of the Page, under the cover photo, click the Like button with the thumbs up icon. Make sure it says Liked after you click it. 5. After you have Liked the Page, give us a call—Monday through Friday 8 A.M. to 8 P.M. E.T. A member of our Facebook Support team can grant you admin access. 1. Log in to your personal profile on Facebook. 2. Visit your Facebook Business Page. 3. On the left side of the Page, under the cover photo, click the Like button with the thumbs up icon. 4. After you have Liked the Page, give us a call—Monday through Friday 8 AM to 8 PM ET. 1. Click here to log into Facebook. 2. Go to Notifications in your Facebook account and click the admin request. 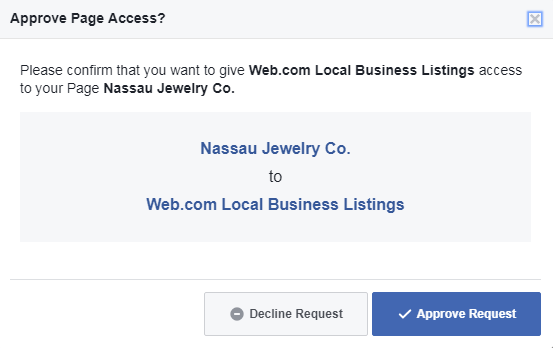 If you are unable to locate Web.com's admin request, visit your Facebook Business Page and click Settings, then Page Roles. 3. In the Pending Partner Requests section, click the Respond to Request button. 4. Select Give Web.com (or Web.com Local Business Listings) access to my Page. 5. Click the Approve Request button. 6. Click Submit, then click Save. 1. Go to Facebook.com and log into your personal profile. 2. At the top right side of the Page, click the dark blue down arrow. The arrow turns white, the drop-down menu appears, where you can view and select your Business Page under Your Pages. 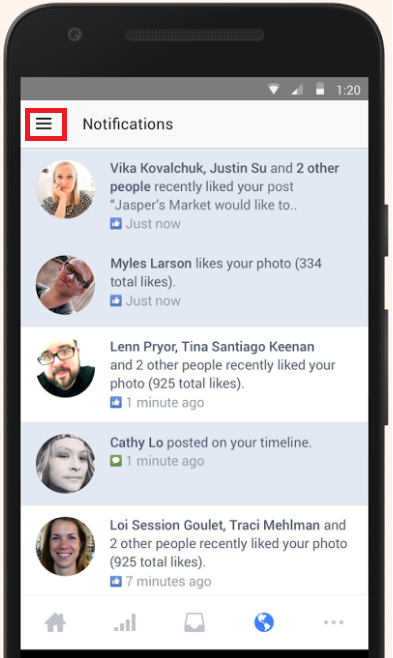 The Facebook Pages Manager lets you manage up to 50 Pages from your smartphone or tablet. You can check Page activity, share business information, and communicate with your audience, and see insights. Right now, the app is available on iPhone, iPad and Android in some countries. 1. Download the Facebook Pages Manager app from your app store. Click here for the iTunes App Store. Click here for the Google Play Store. 2. Open the app and log in using the same credentials you use to sign into your personal Facebook profile. All Pages you have admin access to should automatically appear in the drop-down menu on the top left side of the screen.